Sergei Murasaki, Kosinki, Stalker Sandor, Iterovich… No matter which pseudonym we use to refer to him, Chris Marker was the first‚ the first geek, the first programmer, the one who dove into computers, graphics cards, PEEKs and POKEs, who took a bite out of the apples of Alan (Turing) and Steve (Jobs and Wozniak). Marker programmed in 64k, 128k and 256k, wielding 5.25 floppies, poetry and invention. 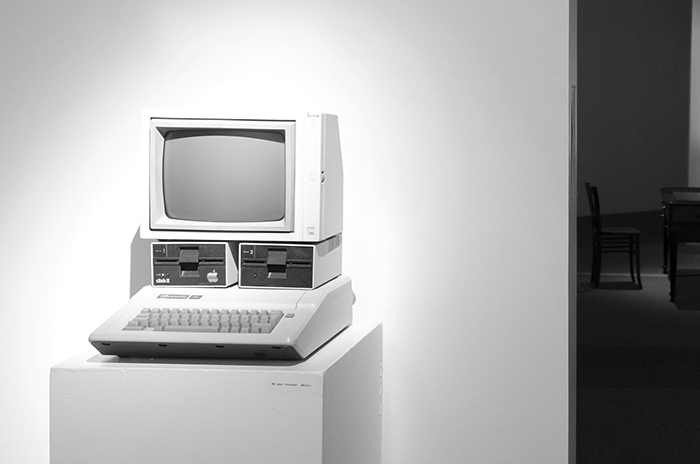 He wrote lines and lines of Basic code on his Apple // e, c and GS, those marvelous machines of the 1980s. Marker was a genius of computer thinking, inversing algorithmic logic, dodging digital syntax and refusing the label of visionary artist : “Let’s leave that to Steve Jobs”, he wrote. It’s 2011. Marker e-mails us a few old annotated pages of the DIALECTOR program, as well as a dialogue sample. Then he finds the infamous 5.25 floppy and sends it over. It’s version 6 of the program. Time passes. It’s 2012. We manage to track down an Apple // machine and its person. Together we set off on this journey into the history of computer programming. The floppy is readable. 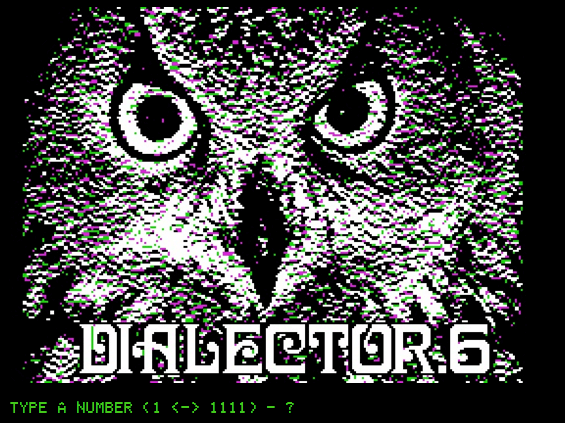 Version 6 of DIALECTOR, however, won’t execute and stops at the third command line, on the image of an owl. We extract the contents of the disk and discover that all the DIALECTOR files and version 6 of the program are intact, more than 20 years after they were saved‚ a miracle in the merciless world of programmed digital obsolescence. We convert them to text format and return them to Marker the same day, as requested. It’s 2015. We have analyzed Marker’s lines of code and translated the program originally written in Applesoft Basic into a contemporary programming language. DIALECTOR runs on our computers. History is now imaginable. We converse with the program’s protagonist, whose name is COMPUTER. We spend hours in front of the computer screen, our machines and our apples. DIALECTOR is inexhaustible, with the humor of an English-speaking cat, a New York owl and a passing face. It’s 1988. DIALECTOR suggests the futuristic and a-mortal vision of an anachronistic computer science dedicated entirely to poetic thought. In his stab at programming, Marker wrote the future face of machines: not very spectacular and, in a way, much more terrifying. He (perhaps unintentionally) predated a model of modernist fantasy that elevates the computer network to a possible matrix world, whose elements are already in place. The static, rudimentary art of reading on screen is now devoted to the irresistible ascension of the owl‚ eternal muse of the world according to Chris. According to Marker’s friend and engineer Paul Lafonta, previous versions were clearly geared toward multimedia development (touch screen, interactivity, etc).